Omaha Burke, the No. 1 ranked team in Nebraska Class A football, opened its season at home against Lincoln Southeast on Friday night. The Bulldogs looked every bit the part of a top ranked team in the state even if their coaches and players said they didn’t deserve to be ranked in the top spot. 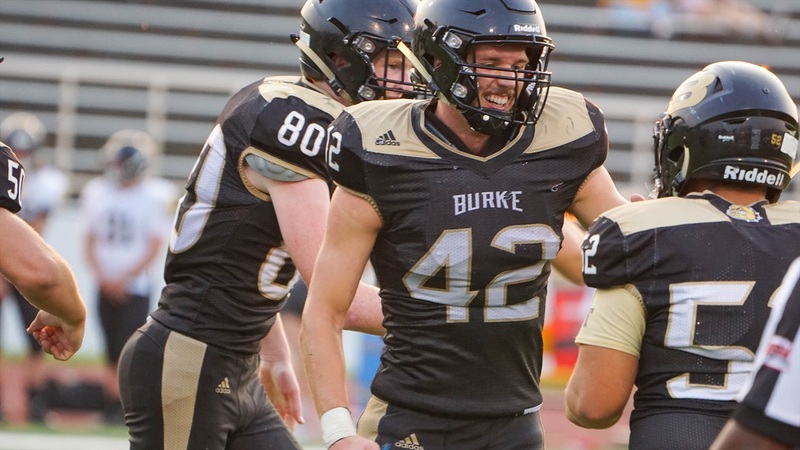 Two of Burke’s senior leaders, Huskers linebacker commit Nick Henrich‍ and 4-star (HV Rating: 90.3) TE prospect Chris Hickman‍, garner a lot of attention but the Bulldogs are loaded with talent beyond just those two. And it showed in the season opener. One of the first plays from scrimmage for Burke, quarterback Tyler Chadwick connected with 2020 WR prospect Xavier Watts‍ for a touchdown. Watts helped power Burke’s 35-7 halftime lead with his three catches for 99 yards and two touchdowns in the first half. Burke went on to win the game 49-28, but it wasn’t as close as that score would indicate. The Bulldogs pulled their starters in the fourth quarter, which helped Lincoln Southeast score 21 of its 28 points. Southeast 2020 safety prospect Issac Gifford had a nice night on defense. He’s definitely gotten bigger over the last year, and highlighted his tackling strengths. The overall talent for Burke is eye-opening. Watts, Chadwick, RB/DB James Burks, RB/DB Gio Mainor and RB/DB Jaylon Roussell all jumped out as players that need to be accounted for throughout the game. Burke’s mantra for the season is "unfinished business" and there are a lot of expectations for this team to make a run at a state title. Step one? Win the first game of the season. Hickman echoed those thoughts but also added that since it was the first game, the team still had some rough spots. He felt good that those things would be fixed with a hard week of practice. As for how the pair performed on Friday, neither disappointed. Watching Henrich, it's clear he's reached his goal of getting bigger, faster and stronger since last season. He’s a true sideline-to-sideline linebacker with good instincts and a knack for being around the ball. Henrich is also a very good blitzer, which isn’t always the case for inside linebackers. Nebraska defensive coordinator Erik Chinander will certainly find way to utilize that skill in the coming years. Henrich ended the game with 11 tackles including two tackles for loss, a sack and a blocked punt. As for Hickman, it’s easy to see why Nebraska and other major programs are after him. He’s a versatile player and his frame (6-6, 205) gives him some real position flexibility at the next level. He wasn’t really able to get going on offense due to the pressure Southeast was generating but he’s a good route-runner. There were multiple times he broke open but there wasn’t enough time to get him the football. The most impressive aspect of Friday's game was Hickman’s physicality. He blocked well from his tight end spot but he was excellent on defense all night. He set the edge well at defensive end but was also moved around quite a bit to take advantage of his athleticism. Hickman ended the night with five tackles and a pair of tackles for loss. He was only targeted three times on offense. One thing that continues to impress about both players is their leadership qualities and willingness to do what is needed to help the team. Both Henrich and Hickman played in all three phases of the game. They are both strong senior leaders setting a good example for their teammates. Omaha Burke hosts Millard West at Burke Field next Friday night.